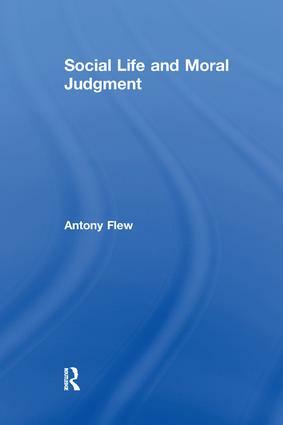 "In Social Life and Moral Judgment, author and philosopher Antony Flew examines the social problems induced by the mature welfare state. Welfare states make ever-increasing financial demands on their citizenry, yet the evidence clearly supports that such demands are not sustainable. In this superlative collection of thematic essays, Flew investigates and explains why this is so, and calls for a return to individual responsibility.The first essay establishes the philosophical basis for his argument. ""Is Human Sociobiology Possible?"" answers its titular question in the negative, asserting that we are all members of a peculiar type of creature that can, and therefore must, be responsible for whatever choices between various courses of action or inaction that are open to us as individuals. In other essays, Flew shows how state welfare systems inevitably corrupt and demoralize their citizens by encouraging ever-more people to apply for welfare entitlements and reducing the incentives to avoid or escape the conditions warranting those entitlements. He investigates the origins of this new kind of welfare entitlement, and shows how very different what politicians and public sector employees produce is from what these people claim to be producing.Flew shows that the drive for ""social"" justice appears to require that the justly acquired income and wealth of all citizens should be progressively taxed away or supplemented by the state so that the eventual result is more, though never perfect, equality. This objective, he asserts, must be radically distinguished from old-fashioned, without prefix or suffix, justice. It was this type of justice Adam Smith referred to when he famously said that it is a virtue ""of which the observance is not left to the freedom of our wills"" but ""which may be extorted by force."" Flew question the aims of those who would discredit wealth creators and wealth-creating investment, showing that these are the same people who prom"